Can I create a mail merge directly from Wealthbox? Yes, you can create a mail merge from an individual contact record or for a filtered list of contacts from your contact list page. Account Owners or Admin users can upload mail merge templates by clicking “Mail Merge Templates” within your Settings > Workspace > Customizations. Click here for instructions to create templates in MS Word. Give the template a name and then upload your letter template. Click on “Mail Merge” within the “Contact Details” panel on the right side of the contact record page. Click “Contacts” from the left side navigation panel. 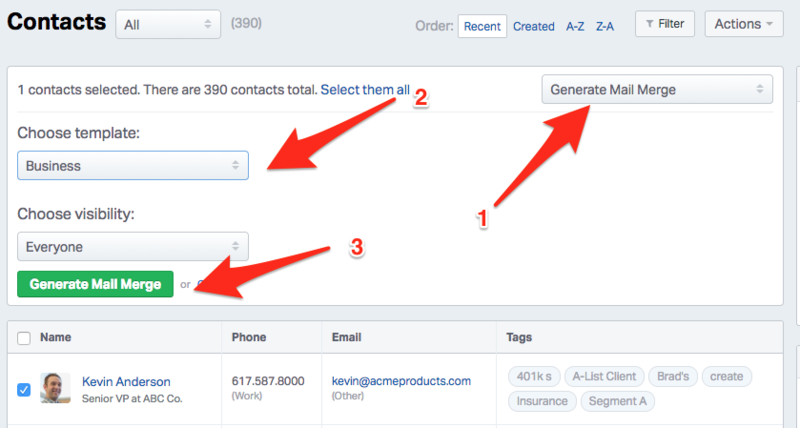 Filter and select the contacts you would like for the mail merge. Select the mail merge template, choose your visibility and click the green “Generate Mail Merge” button.